Yikes! No post yesterday… bad when you are already off track on the 4th post of your blog! I was sewing like a mad-woman all day, then rushed to knit night at the local mead tasting room last night and didn’t get a chance to sit down at the computer. This is especially sad since I had something to post and everything! So, as a little treat to myself for being such a productive, disciplined, motivated person while sewing I made myself a present. 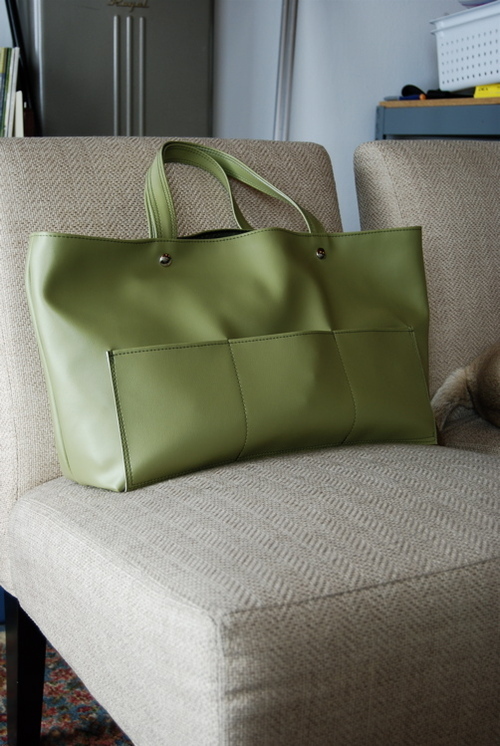 It is so funny to say that since in the last 5 years in the bag business I have NEVER made myself a bag that was never to be an actual design for sale. Anywhoo, I made a big ‘ol mobile knitting office. Yes, you heard correctly, a mobile knitting office. I made these cute clutch bags which I love dearly and use everyday, but since I am starting to do crafting full-time instead of sewing full-time I am transporting a lot more knitting, a lot more often. So I needed a behemoth bag. 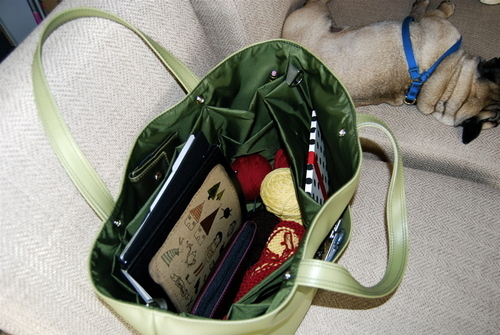 I was inspired by the amy butler knitting totes which one of my LYS owner’s has and showed me one day. Here is the inside, 12 pockets in all of their glory. And yes, that is a sleeping Lu Lu next to it on her chair. Yes, her chair. This sucker is HUGE. 23” across at the top (which I of course just mistakingly typed 23’ the first time), 12” tall and about 8” deep. Yes. Exactly what I needed, I love, Love, LOVE it to death. I’m so happy! And yes, the bear booklet are now out in our shop at Crafty, Inc. They are super super cute, but more on that tomorrow!